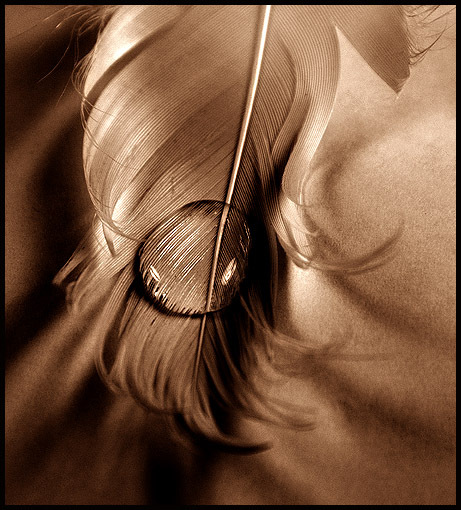 A feather and a drop of water. I love the tones and softness of this photo. I like the graininess of the background vs. the clarity of the droplet of water. Nice sepia tone. Good focus on the water drop. what a spectacular shot.. took me a while to figure out what it was.. This is a lovely photograph! The sepia tone really adds an air of nostalgia to the composition, which evokes an age of quill pens. Incredible focusing. Love the details in the feather. Very beautiful curves. Contrast of the shadows are really good and helps to bring out the subject. Wished that the droplets had more highlights or something to really make it pop out of the shot. Love the choice of sepia here, nice work. Proudly hosted by Sargasso Networks. Current Server Time: 04/18/2019 08:27:44 AM EDT.